Police reportedly used pepper spray and a stun gun as seven people were arrested in Baton Rouge, Louisiana, on Wednesday during a march to memorialize Alton Sterling, the black man who was shot dead by a white police officer exactly a year ago. Baton Rouge Police Department said that three women and four men were taken into custody at the conclusion of the march after they allegedly tried to break through barriers set up outside police headquarters. 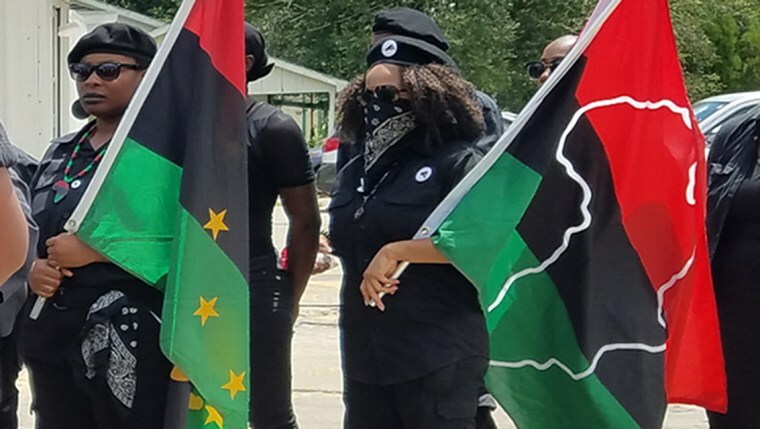 According to the Times-Picayune, police told protesters, who were mostly members of the New Black Panther Party, to remain behind the barricades put up across the street from the Police Department. Protesters didn’t obey the order and a scuffle ensued. Police spokesman Sgt. L'Jean McKneely told reporters that the seven had been charged with "entering and remaining after being forbidden" and for resisting arrest. Police have not released the names of the arrested. Approximately 30 people attended the protest, and at least 20 police officers were present, the Times-Picayune reported. McKneely told to the paper that at least one officer fired a stun gun and others used what he described as a "pepper ball" on the crowd. One of the officers was apparently accidentally shot by another officer’s stun gun, the Times-Picayune reported. At the location of the July 5, 2016 shooting, where the march began, a number of local business owners told the Associated Press that the majority-black area is still “overlooked” by city officials. "It's not much that the city does around here," said Abdullah Muflahi, the 29-year-old who owns the store where Sterling was shot in front of. "There are things that the city could fix and help make it better, but nobody looks at it like that." Muflahi added that the community’s distrust of the police has only grown and that tensions between the department and residents remains. Officer Blane Salamoni shot Sterling six times during a struggle outside a convenience store where the 37-year-old was selling homemade CDs. Officer Howie Lake II also wrestled Sterling to the ground but didn't fire his gun. The Justice Department announced in May that it will not file charges against either of the officers involved in the shooting. The state attorney general is still considering whether to charge them. Meanwhile, the two officers have been on paid leave since the shooting. Baton Rouge itself faces a wrongful death lawsuit brought by Alton Sterling’s five children. The police department, police chief and two other officers are also named in the case. A candlelight vigil was planned for later Wednesday evening.